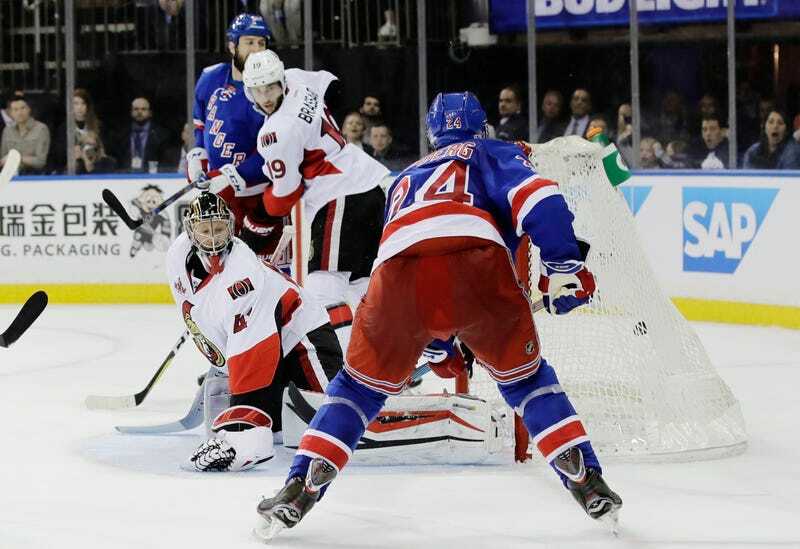 The Rangers’s 4-1 pummeling of the Senators in Game 3 was maybe the most expected thing in the world. New York is almost certainly the better team to begin with in this series, and has played like the better team for long stretches of it. Here’s a stat: Still down 2-1 after last night’s win, the Rangers have now led for 94 minutes, while the Sens have led for 4:51. The Rangers scored the game’s first four goals, each coming from a different line, and this one feels like it has seven games written all over it. So let’s mostly dispense with a game recap and just show a pair of highlights, two truly beautiful assists not done justice by the box score. Consider this evidence for the case that sometimes the primary assist is more difficult and more important than the goalscorer. The Rangers’ fourth goal went to Oscar Lindberg, but it was J.T. Miller with most of the hard work. Miller outskated and outmuscled Mike Hoffman to carry this puck toward the slot, where he rifled a pass under the stick of Erik Karlsson, who was kind of caught in between challenging Miller and staying with Lindberg, who had drifted to the side of the net. Ryan’s been on fire this postseason, but he had to leave last night’s game in the third period after taking an Erik Karlsson shot to the leg. The Senators will be holding their breath, especially since Guy Boucher’s 1-3-1 neutral zone-clogging defensive system has not done much to slow down the Rangers’ offense. Craig Anderson sports a career 9-4-1 record in New York, but he’s going to need to be even better on Thursday to keep the Rangers from evening a series in which they already feel like they have the upper hand.